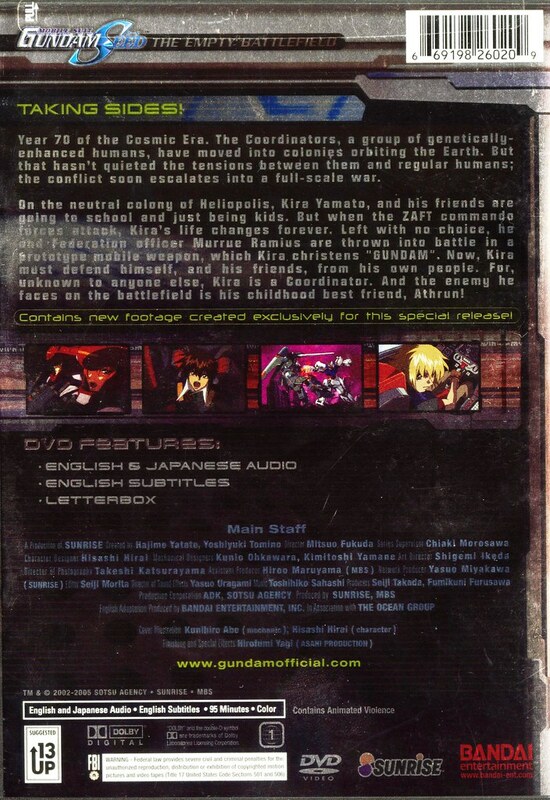 You are currently looking at a GUNDAM SEED THE EMPTY BATTLEFIELD (DVD)(English & Japanese audio) In new unopened factory sealed condition. Box has light wear. See pictures or contact for further details on condition. Part of the long-running and popular GUNDAM anime series, MOBILE SUIT GUNDAM SEED: THE EMPTY BATTLEFIELD is a feature film-length recounting of the events that took place during the original MOBILE SUIT GUNDAM SEED television series. In the far-flung future, a war has erupted between two interplanetary groups of humans: the genetically-modified Coordinators and the Earth-based Naturals. The Coordinators' greater technology gives them the upper hand, but the Naturals have their own secret weapons in development. Kira Yamato is a Coordinator who stumbles upon the Gundam mobile suits, powerful war machines that the Naturals will use to defend themselves. Enlisted into their cause, Kira is forced to battle his own people to save his friends in this epic anime film.